do you know what to do if your pet is choking? if your pet is hit by a car... what steps would you take? what would you do if your pet stops breathing? your pet is bleeding... how do you stop it? if your pet has hypothermia - what must you do right now? what should you do if your pet has broken their leg? your pet is suffering from shock - what must you do to ensure their safety on the way to the emergency vet? if your pet has been bitten by a poisonous snake or spider - what should you do? I've written Pet First Aid Secrets: Complete Canine and Feline First Aid Manual as a guide to help you become a prepared pet owner. I've included the most common emergencies that I have seen arrive at my clinic and throughout my career as a Veterinarian. ...even if you have never treated anything, and don't have the foggiest idea about animal medicine. Most pet owners are unprepared for dog and cat emergencies - I want you to be prepared, because emergencies happen everyday. I have spent years exploring ways for pet owners to administer first aid. 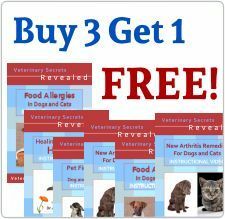 Pet First Aid Secrets allows you - dog and cat owners - to administer first aid, to care for your pet and treat emergencies at home. Pet First Aid Secrets will provide all the information you need - without medical jargon, and without complicated procedures. The willingness to comfort and care for your sick or injured pet so you can alleviate pain and begin treatment BEFORE you reach the veterinarian. Car Accidents - very common: here is what you NEED to watch for, PLUS reacting to the MOST COMMON injuries. Fractures in dogs and cats happen often - here is the most effective splint that can prevent further damage... AND effective Pain control. The signs to watch for if your pet has NECK PAIN. How to decide if it is serious, PLUS how to respond at home. CPR. What to do if your pet STOPS breathing, if your Pet is Choking or her Heart STOPS. Abdominal Wounds. Emergency At Home Care, What to do if the organs are showing and The "secret" household item that could save your pet. Treating your Pet for Shock - exactly what to do to ensure that your pet survives while on the way to the emergency veterinarian. Chest Injuries in Dogs and Cats - the Quick Actions you must take IMMEDIATELY. What to do if your pet is Poisoned - four specific common poisons and how you MUST treat them at Home. The two extremes of temperature, Heatstroke (Hyperthermia) and extreme cold, Hypothermia. How you should immediately respond - and what you SHOULDN'T do. Bleeding in Your Pet - How to End it FAST it. Pressure Points to slow the flow, PLUS Stopping Ear, Head and Nose Bleeding. Snake and Spider Bites - What you MUST do first to Stop the toxins... this simple step can save your pet. A vomiting dog or cat needs this to happen FIRST. Know exactly what you must give, PLUS natural at home remedies. ... the book covers a total of 64 different first aid situations and how you can deal with them. To view the contents of the book, click the "Table of Contents" tab. If you have any questions about the book, please contact support here.